Grandma made these every year just after Thanksgiving so they would be ready for Christmas. Once made, pack them in sealed containers -- aging makes them better. Even as kids, we ate these and, because they ship well, they were packed in care packages. Combine all ingredients. 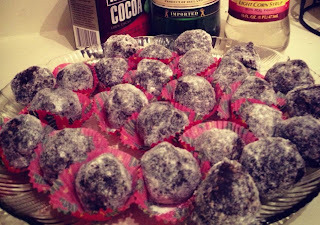 Roll into little balls, then roll in some extra confectioners sugar. Store in airtight container. Love your recipes! They have my mouth watering...I thought you might be interested in sharing your recipes and cooking tips with us at Foodista. It's a cooking encyclopedia that everyone can edit, full of recipes from around the world and much more! We also have small embeddable widgets that you can use to build traffic from Foodista-related pages. Check it out here and let me know what you think.Thanks!